Pruning rose bushes is an important part of caring for roses, but there is some debate about exactly when and how roses should be pruned. The good news is, it's very difficult to kill a rose by pruning it wrong, and the benefits of pruning outweigh any potential risks. The main reason most people prune their rose bushes is to encourage new growth, particularly blooms. Pruning also allows you to get rid of any dead growth, making for a healthier plant overall. Other reasons for pruning rose bushes include to alter their shape or control their size, and to improve air circulation within the plant. Opening up the plant also lets more light penetrate the plant, which will make it stronger. The most important thing when it comes to pruning roses is that you use very clean, sharp tools. A bypass pruner and long-handled loppers are the most common pruning tools. The reason you need to keep your tools clean is that, if one of your rose plants is diseased and you prune it, you can pass the problem on to other plants by pruning them with shears that haven't been cleaned. If you know that your cutting tools have been exposed to an unhealthy rose, clean them with a little rubbing alcohol before moving on to your healthy plants. Otherwise, you can just clean them with water and wipe them dry before storing. Sharp tools are necessary because using a dull tool may lead to a ragged cut on the plant, which isn't healthy. 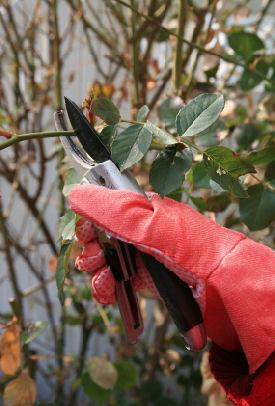 Other tools you will want for pruning roses include heavy-duty gloves, preferably long ones, to protect your hands and arms from thorny scratches, a long-sleeved shirt, and maybe even goggles if you're doing a lot of pruning and might be cutting something that could fall into your face. A garbage can or leaf bag is a handy place to put trimmings as you go. The most difficult part of pruning roses is to know when to do it. The answer will depend on what type of rose you have. Most of the common varieties of roses, with the exception of some climbing and rambling roses, are best pruned in the spring. The varieties of roses that bloom on old growth should be pruned after they bloom. Roses that bloom on new or recent growth can be pruned in the early spring, about the same time the forsythia is blooming. If you don't have a forsythia bush handy, look for a swelling of the leaf buds on your roses (they'll get a little bumpier and reddish looking). As mentioned earlier, it is hard to really harm rose bushes by pruning them. You might have a year with very few blooms if you prune hard at the wrong time of year for the plant you have, but you'll learn never to do that again. The most important thing when it comes to pruning rose bushes is knowing where to cut. It's easy to see where to remove deadwood, but when it comes to cutting out healthy parts, it can be tricky to know where to start. Cuts should be made about a quarter of an inch above a bud that is facing to the outside of the plant. Cuts should also be made at a 45-degree angle. All this sounds like a lot of specificity, but you'll get the hang of it quickly. Take the shape of the plant into consideration as you prune, but prune from the base of the plant rather than from the top down. If you see any growth that is not yet as thick as a pencil, go ahead and trim that away as well. Most roses can take pruning as much as one-half to two-thirds of their height each spring and will reward you with a season full of strong growth and beautiful flowers.